Warner Bros have released the new Justice League Official Heroes Trailer! 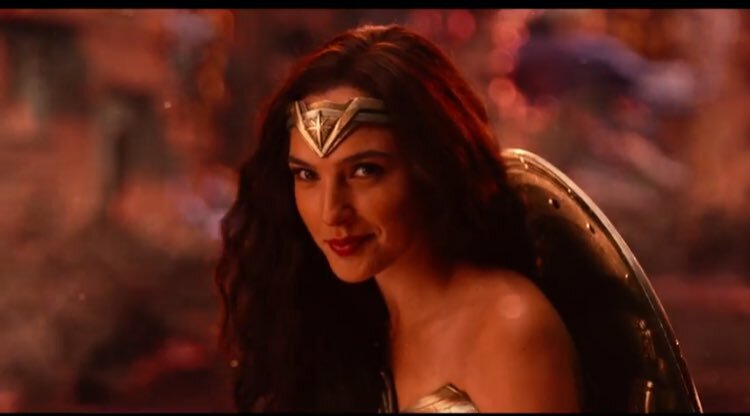 In Justice League, fueled by his restored faith in humanity and inspired by Superman’s (Henry Cavill) selfless act, Bruce Wayne (Ben Affleck) enlists newfound ally Diana Prince to face an even greater threat. Together, Batman and Wonder Woman work quickly to recruit a team to stand against this newly awakened enemy. Despite the formation of an unprecedented league of heroes — Batman, Wonder Woman, Aquaman, Cyborg and the Flash — it may be too late to save the planet from an assault of catastrophic proportions! 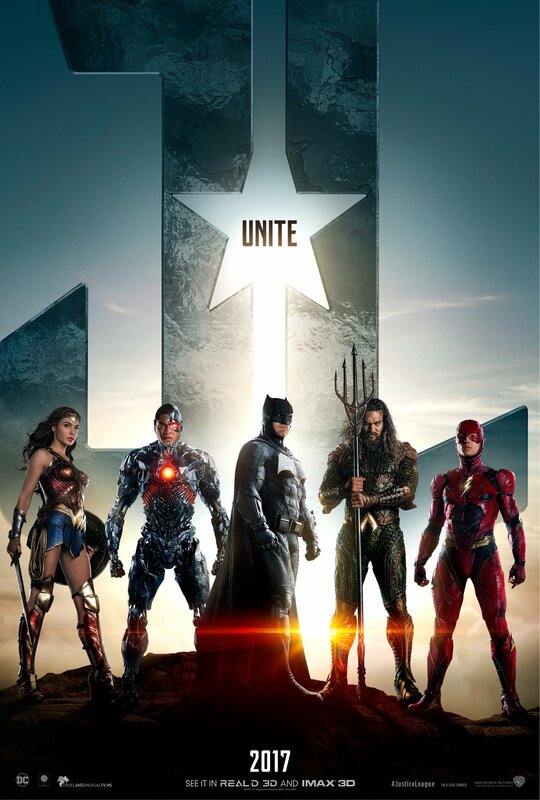 Justice League is directed by Zack Snyder, from a screenplay by Chris Terrio, based on a story by Snyder and Terrio, Justice League stars Ben Affleck, Henry Cavill, Gal Gadot, Jason Momoa, Ezra Miller, Ray Fisher, Ciarán Hinds, Amy Adams, Willem Dafoe, Jesse Eisenberg, Jeremy Irons, Diane Lane, Connie Nielsen, and J. K. Simmons. 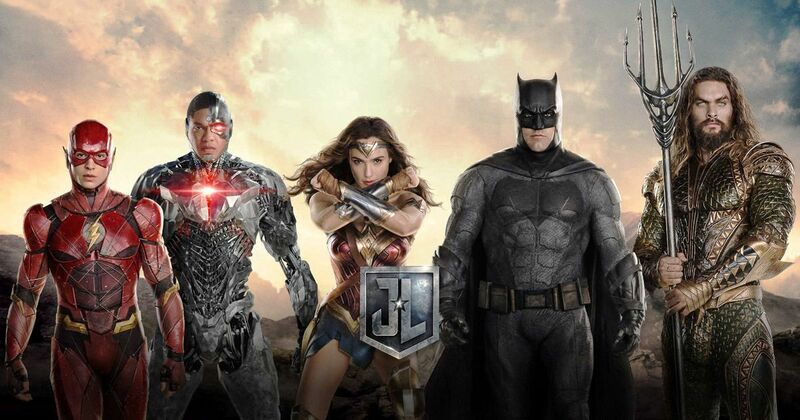 Justice League opens in theaters on November 17, 2017. Warner Bros have released a new Justice League trailer at Comic Con International San Diego. 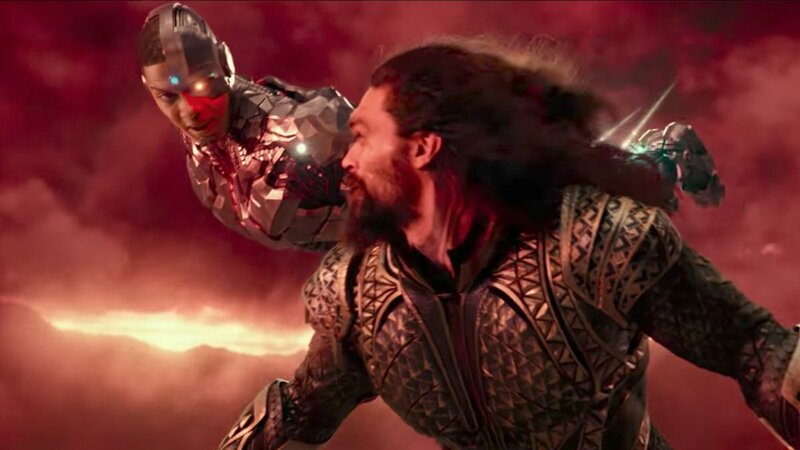 The special sneak peak Justice League trailer reveals loads of new footage! In Justice League, fueled by his restored faith in humanity and inspired by Superman’s (Henry Cavill) selfless act, Bruce Wayne (Ben Affleck) enlists newfound ally Diana Prince to face an even greater threat. Together, Batman and Wonder Woman work quickly to recruit a team to stand against this newly awakened enemy. Despite the formation of an unprecedented league of heroes — Batman, Wonder Woman, Aquaman, Cyborg and the Flash — it may be too late to save the planet from an assault of catastrophic proportions. 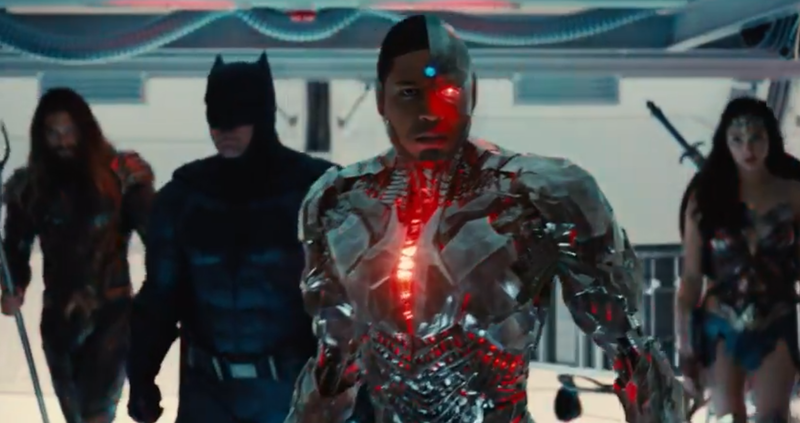 Justice League 1st Official Trailer Released! Justice League 1st Official Trailer! 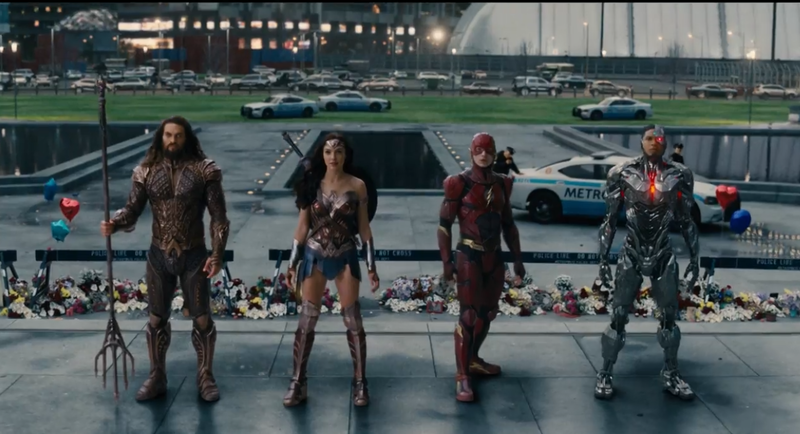 Warner Bros. have released the new trailer for Zack Snyder’s Justice League. Check it out, this looks amazing! Justice League’ is release November 17, 2017. The Dark Knight returns to Gotham City in the extra sized Batman #50 for the thrilling conclusion of Snyder and Capullo’s epic Superheavy story-arc! Bruce Wayne has regained his memories and reclaimed the mantel of the Bat to join Jim Gordon in the battle against Mr Bloom and save the city they have sworn to protect. Batman #50 sees the return of Bruce Wayne to the cape and cowl as Mr Bloom and his super-powered-seed army lays siege to all of Gotham. With the city reeling from Mr Bloom’s onslaught, Batman, Jim Gordon, and Powers Internationals army of GCPD Bat-Bots unite against Gotham’s towering new super villain, and the fate of the city will be decided as Batman’s showdown with Mr Bloom reaches its thrilling conclusion! Scott Snyder’s and Greg Capullo’s Superheavy arc saw Jim Gordon step up as Gotham’s new Bat-Bot suited Dark Knight following Batman’s apparent demise in Endgame while Bruce Wayne – now without his memories of being Batman – forged a new life with his old flame Julie Madison. Jim became the Batman the city needed at this dark time, but Bruce’s past wouldn’t rest easily, the Joker also survived Endgame, albeit radically changed by the experience, and now Mr Bloom’s rise to power has forced Bruce to sacrifice his newfound life to become the Batman again. Superheavy Part 10 stands as the total culmination of everything Snyder and Capullo have achieved with this story-arc, and it is only now that we can begin to fully appreciate the immense scope and scale of this game-changing storyline as it races towards its city shaking finale! The beard may be no more, but Bruce Wayne is well and truly back in Batman #50 all kitted out in a new Bat-Suit and ready to give the citizens of Gotham a Batman they’ve never seen before – the Dark Knight they’ve deserved all along. Meanwhile, it’s all going to hell in Gotham as Mr Bloom and his seed-powered minions go on the rampage, while Julia Pennyworth tries to get the injured Jim Gordon to safety, and the Robo-Bat-Suited Commissioner Sawyer leads Gotham’s robo-suited Finest in the fight against Mr Bloom. 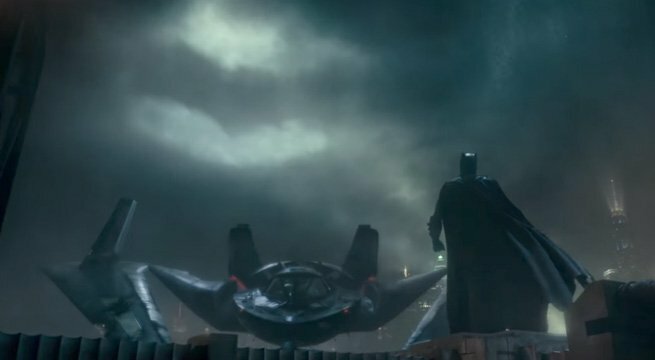 Just when it seems that all is lost, the one, true Dark Knight finally returns, rising from the shattered vestiges of Gotham’s most iconic symbol. It’s the rousing moment we’ve all been waiting for since Superheavy began and Snyder delivers it with a series of fan-pleasing moments, revitalized by the Dionesium and with Penny One to welcome him back, its clear Batman is relishing every moment of being back in the cape and cowl. This issue, perhaps more so than any before, exemplifies everything that Snyder and Capullo have done during their tenure on Batman. Sure, Batman #50 is packed with city smashing drama, but as fun and exciting as all the Bat-Bot action is, it is instead the emotionally charged character moments Snyder uses to punctuate the drama at key moments that really strike a chord, especially the moving reunion between Batman and Gordon, we also discover what happened to Duke Thomas’ parents, and there’s a bizarre connection amidst some recently acquired evidence that provides a sinister and unexpected connection to Mr Bloom’s origin. Greg Capullo has well and truly surpassed all our expectations with his artwork on this issue. It looks absolutely stunning! Every page will have you mesmerised by the way Capullo maintains the fluidity and pace of the plot, infusing every scene with a staggering level of detail that almost defies description, to make Batman #50 one of his finest issues ever. From the symbolic moment of Bruce choosing of a new costume, to its eventual reveal, the nail biting tension in the Bat-Blimp high over Gotham, though to Gordon’s resolve to find another way to get the job done, and the bombastic smack down between Batman and Mr Bloom, Capullo pulls out all the stops here, along with Danny Miki’s brilliant inks, and FCO’s glorious colors, to deliver the rousing finale for the conclusion of Snyder’s epic Superheavy storyline. If this issue was a gym session, then suffice to say it’s probably the most extreme work out of Capullo’s artistic talents we’ve ever seen.! 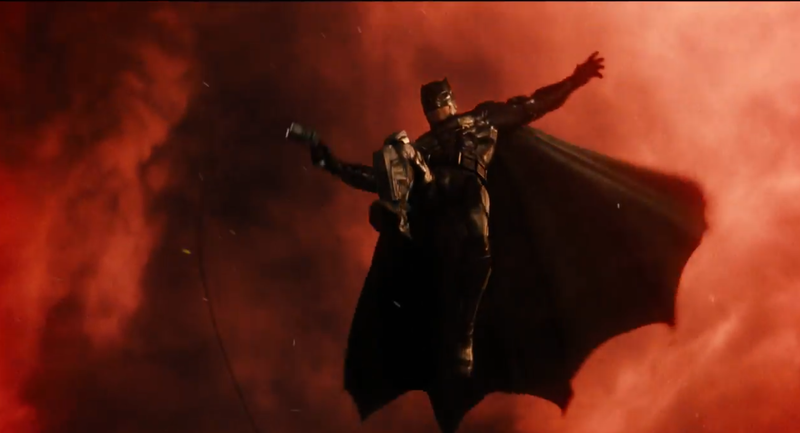 The redesign of the Bat-Suit is both subtle and effective, with some classic embellishments – one in particular being a symbolic fusion of the old and the new in a way that I‘m really pleased to see carry over from Gordon‘s EVA Bat Suit – along with new gloves and cape, but despite all the upgrades and tech its still good to see that some things never change; especially when it comes to Batman getting the boot in during a fight! Batman #50 also features an eight page coda, written by Scott Snyder, and featuring terrific artwork by Yanick Prouette and colors by Nathan Fairbairn As epilogues go, this little interlude actually proves to be just as powerful and as moving as the main bulk of the story in the issue. The initial focuse is on Jim Gordon, there are some wonderful scenes here, lots of familiar faces, and it seems that there are going to be some pretty major changes at the GCPD as well. Of course it’s when Jim and Batman finally discuss everything that happened since Endgame as they survey the wounded city before them that are really this codas finest moments, and there’s even time for a reconciliation between Duke and Bruce, and some poignant reflection for Julie Madison. Well… here we are. 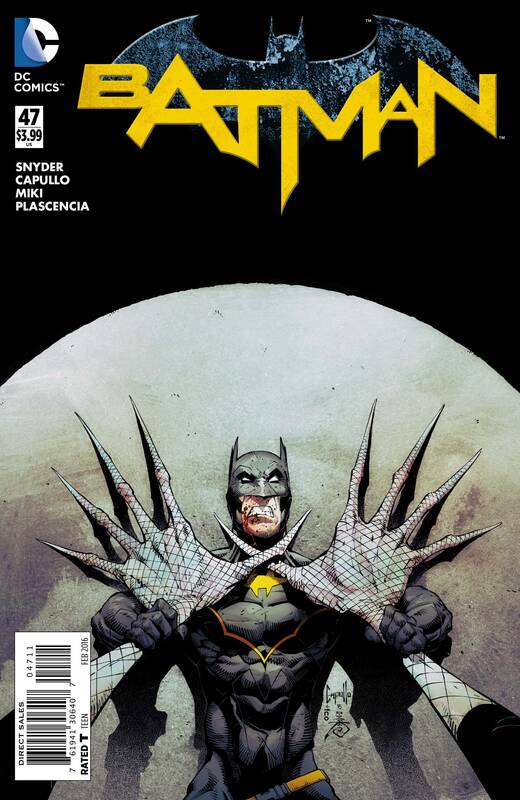 Yes, as we now know, Batman #50 is indeed Scott Snyder’s and Greg Capullo’s penultimate issue of Batman. Their run on this series has been a tremendous achievement; and its brought us so many incredible stories and iconic moments. Snyder and Capullo have redefined the mythology of the Bat itself, and then some! Having announced their tenure will conclude next issue with Batman #51, Snyder and Capullo have been saying for a while now that they plan to reunite on another project in the near future. In the interim, Batman #52, by James Tvnion IV and Rafael Alberque will bring this current volume to an end before Batman relaunches in June with a new creative team as part of DC’s forthcoming Rebirth event. I will look to the future with a mixture of sadness, trepidation, and anticipation for the future of this title, along with Rebirth and the changes it brings to DC Comics, and excitement for what Snyder and Capullo will do next. For now though, let’s not dwell on goodbyes, or what the future might hold just yet. Instead, we should celebrate this incredible giant-sized 50th issue of Batman, along with the momentous accomplishments that Scott Snyder and Greg Capullo have achieved on this title together with Danny Miki and FCO Plascencia. What a team! Batman #50 is a full-on epic issue in every sense of the word, the story and art will blow you away, and you will be left with an overwhelming sense that you have just read one of the greatest Batman issues ever made. It has all been building towards this moment, now its here at last! Alfred is now all that stands in the way of Bruce Wayne rediscovering the full knowledge of who he really is in Batman #49, as Scott Snyder and co-write James Tynion IV steer Bruce on a journey that will encompasses a myriad of infinite possibilities which will test his resolve, willpower, and perhaps even his sanity, as an inexorable date with destiny looms. The copious multi-layered aspects of Bruce’s life that Snyder and Tynion IV have spliced into the ongoing narrative of the Supeheavy arc in this issue are mind bogglingly sublime. At times it almost feels as if we’ve sidestepped into the Martrix, with all the fragments all jostling for our attention, before two clear junctures in Bruce’s life slowly begin to run parallel to one another… Alfred is now all that stands in the way of Bruce Wayne rediscovering the knowledge of who he really is in Batman #49, unfolding at Wayne Tower and Wayne Manor as time itself simultaneously becomes a portal to save the future and the last barrier to lock away the past. Its heartrending stuff, the scenes between Bruce and Alfred are truly moving, but with the machinery that will restore Bruce’s mind in such a dire state of disrepair, the key to Bruce’s resurrection rests with what is perhaps the most unexpected – yet ironically obvious – act of trust and foresight of all. With Greg Capullo busy getting ahead with Batman #50, Yanick Paquette (Wolverine, Batman, Swamp Thing, Wonder Woman) and colorist Nathan Fairbairn (Batman INC, Multiversity, Wonder Woman: The Trial of Diana Prince) take over the artistic duties for Batman #49, and what an awesome looking issue it is! I really like how Yanick Paquette alternates the more futuristic scenes with those in the present day, with the multiple projections of Bruce’s lineage often coalescing like temporal thought bubbles, and the uncanny symmetry between the dual entrances into the cave are both magnificently epic and ominously foreboding. Yanick Paquette brings this gloriously mined seam of craziness that Scott Snyder’s and James Tynion IV have created to life with such vivid detail, the sheer power of the emotional scenes will take your breath away, while the stunning rendering of Bruce’s struggle across fracturing realities unfolds over numerous two-page spreads that will simply blow you away with the sheer scope and scale of it all. Batman #49 also features some of the very best Nathan Fairbairn colors you can possibly imagine, Nathan Fairbairn makes every scene come alive in exquisite detail, utilizing a rich pallet of colors that complement the story perfectly. The final moments are heartbreaking in the extreme. Although we all knew this moment was coming, now that we are finally here, the reality of Bruce’s struggle, along with the sacrifice he’s prepared to make, are really hammered home. This is no mere sci-fi cliché resolution either. Scott Snyder has kept us guessing every step of the way with the Superhavy arc, we’ve had a glimpse of the man Bruce might’ve been if he’d never set foot in crime alley as a child, but now the time has come to pull the trigger on that new found life and happiness, and the way in which this point is finally reached is guaranteed to break everyone’s heart. Batman #49 is a superb issue from Scott Snyder and James Tynion VI. It’s one that mixes truths and consequences, where raw emotion and devotion cascade towards the memorial waterfall of a time immemorial, until we reach the threshold of the one line that even the Batman cannot cross… The haunting cover by Yanick Paquette and Nathan Fairbairn is like a Bat version of The Scream with a side order of Nosferatu to send a chill down your spine, lets hope they do a poster or print of this stunning cover one day, its brilliant, and there’s also a terrific Neal Adams variant cover to look out for as well. Batman #49 is a fantastic instalment of the Superhavy arc; everything is now set up for the momentous 50th issue. Hell yeah, its time to go to work! 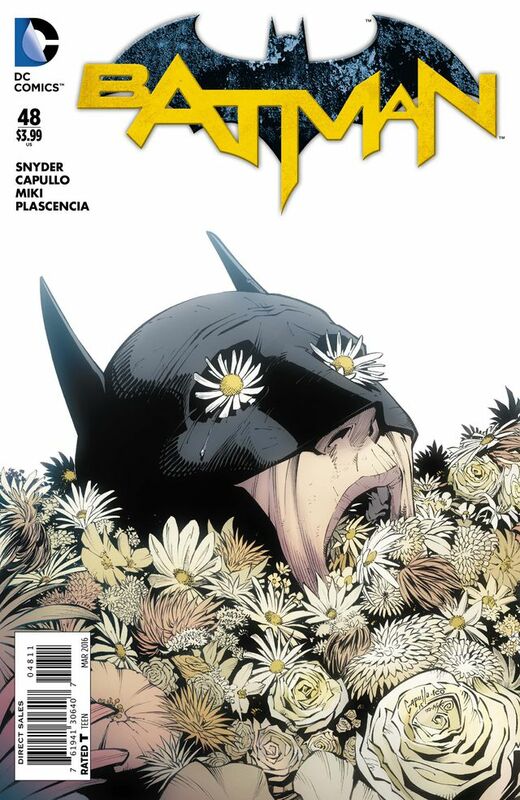 Batman #48 finds Jim Gordon reeling after the attack from Mr Bloom’s super-powered-seed army, just as he was on the verge of unmasking Gotham’s newest super villain. Now, as Batman emerges from the wreckage of the Bat-Truck, this eighth part of Scott Snyder’s and Greg Capullo’s Superheavy arc becomes a nail biting battle for survival for Jim as Mr Bloom’s grand design for Gotham blossoms amidst a super-powered riot of violence and damnation. Meanwhile, Bruce returned to the park bench where his new life began after Endgame, where he meets a mysterious man who also miraculously survived an “accident” nearby. Yes, the Joker is back, and it seems the clown prince of crime has also survived Endgame without the memories of his past life, or so it would seem… Now that Bruce’s memories have begun to return following his argument with Duke and the haunting vision in the subway station in Batman #47, it is perhaps ironic that Bruce Wayne has met this man – who we are led to believe is the Joker – that also just happens to be in the same state of mind which Bruce found himself in after he survived the events of Endgame. I love the ambiguity of these scenes, Snyder has pitched it so well, and you will find yourself hanging on every word. It is here, in Batman #48 that we begin to see how Snyder is brining the pieces of the Superheavy arc together. We’ve watched as Gordon stepped up to become Gotham‘s new Dark Knight, seen the introduction of the new robot Bat-Suit, addressed the very essence of what Batman really stands for, and witnessed the surprise return of the amnesic Bruce Wayne living a new life with Julie Madison and working at the Lucius Fox Center for Gotham Youth. Now in Batman #48 we have a chance meeting that sees Bruce and the Joker sitting on a park bench, as if they were just two ordinary guys, and with the menace posed by Mr Bloom also drawing notable comparisons with terror threats and social divisions now faced in the world today, everything is now eclipsed by the impending conclusion of what is Scott Snyder’s most innovative and cathartic Bruce Wayne story of all. Just like the Joker was to Bruce’s Dark Knight, in many ways Mr Bloom has become the arch nemesis to Gordon’s new Batman, and this issue presents Gotham’s new super-villain with a chance to really up his game. With the seeds of Mr Bloom’s influence now sprouting like weeds from the cracks in society all over Gotham, the full extent of Mr Bloom’s powers, his plans for Gotham, and its citizens becomes clear. Even Jim finds himself unable to escape from the gip of his foes schemes and paraded as an example to reinforce Mr Bloom’s warped ideology. Yet, on a park bench, the lives of Bruce Wayne and the Joker have been inexorably drawn together in Gotham once again, but this time their fates are converging from drastically different perspectives, and it’s a sure bet everything will hinge on the outcome of this bizarre turn of events. Snyder has explored the dark, almost symbiotic parallels between the Dark Knight and the Clown Prince of Crime in ways that few could have imagined possible: from the raw terror unleashed on the Bat-Family by the Joker in Death of the Family, the early origins were then revisited in Zero Year and remoulded, before the savage showdown in Endgame brought both of their worlds crashing down around them, and now we reach a point where everything culminates with their resurrection in Superheavy. Of course the sublime twist this time is that Bruce and the Joker now find themselves on the opposite sides of the mirror. The scenes here on the park bench between Bruce and the Joker are some of the most intense, thought-provoking, and memorable that Snyder has ever written for the characters. Yes, Jim Gordon’s role as the new Batman has been fascinating to explore, all the new gadgets, the Bat-Bot, and giant robots are great fun, but these are the moments that now repay our faith in Snyder and the entirety of this arc as a whole. Greg Capullo has certainly pulled out all the stops for this issue. Every page is a mesmerising tour de force of striking visuals from Capullo, from Gordon confronting the unnervingly creepy Mr Bloom and the onslaught of his super-seed-powered doppelgangers, to the beautifully crafted scenes with Bruce and the Joker, and Mr Bloom’s monstrous new form, Capullo’s work on Batman #48 is some of his finest ever. Danny Miki’s inks bring added definition and clarity to every page and FCO Plascencia’s sumptuous use of color immerse us totally in the atmosphere of the story. The sheer scope and scale of this issue is immense: from the turmoil sweeping across Gotham, Mr Bloom cuts a swath of terror that slices right into the very heart of the city itself, unearthing the dark parallels with many contemporary issues, and the scenes in the park resonate powerfully with the raw emotion of the decision that Bruce knows he now faces. The team on this book are simply amazing, the story, the art, it all clicks together so perfectly and it makes every issue breathtaking to read. So, after the all shocking events in this issue, were will things go from here? Will Bruce end up having to give up his new life with Julie Madison and his work at the Lucius Fox Center for Gotham Youth helping the deprived areas of Gotham to become Batman again? After all, that “final invention” is still sitting there in the Bat Cave gathering dust. Could it be that the Joker will end up being the one that ironically gets the chance of a new life instead of Bruce? Whatever the final outcome, I’m sure Snyder’s labyrinthine imagination has conjured up a resolution in Batman #50 that will completely blow our minds, and we won’t even see it coming! 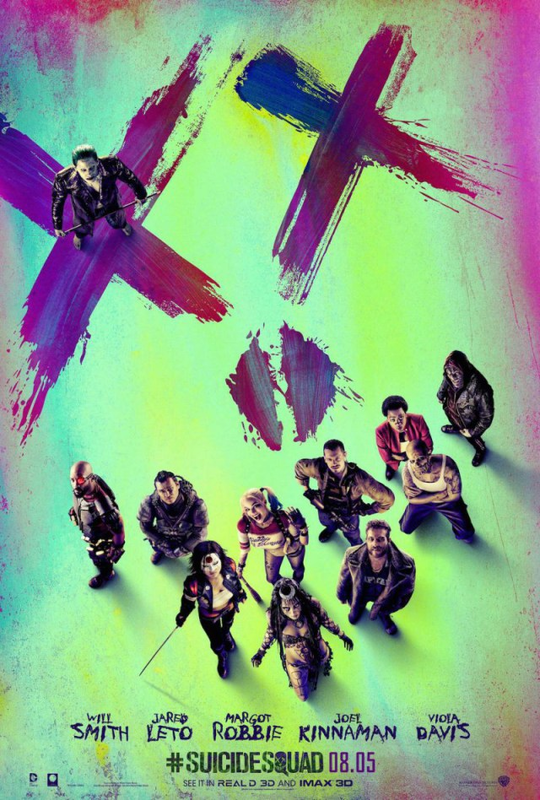 Check out the awesome official trailer for David Ayer’s Suicide Squad! Warner Bros Pictures have also released a new Suicide Squad poster! SUICIDE SQUAD arrives in theaters August 5th. Batman #47 finds the new Batman caught in the vice-like grip of his own robotic Bat-Suit after Mr Bloom – Gotham’s new super villain who has been selling seed implants to criminal gangs that give them superpowers – turned the tables on him! This latest instalment of Scott Snyder’s and Greg Capullo’s exciting Superheavy arc entwines several key plotlines, with Jim Gordon fighting for his life, Batman #47 also heralds some unexpected developments for Bruce Wayne, and Mr Bloom’s grand schemes begin to blossom. After refitting the Robo-Bat-Suit with a blocking device to neutralise Mr Bloom’s powers, Gordon tracked his foe to the area that was once know as Blossom Row in the Narrows. But when Mr Bloom somehow overrode his commands and turned Gordon’s “rookie” partner against him, Jim Gordon suddenly found himself at the mercy of his own Bat-Suit! Scott Snyder piles on the tension and suspense here as Gordon battles the combined threat from his own Bat-Suit and Mr Bloom. Meanwhile, Duke must find a way to escape from the new Iceberg lounge, and Bruce Wayne’s new life without the legacy of the Bat following the events of Endgame is thrown into turmoil when he is forced to look into the shadows of the past. I really like how this issue unfolds. 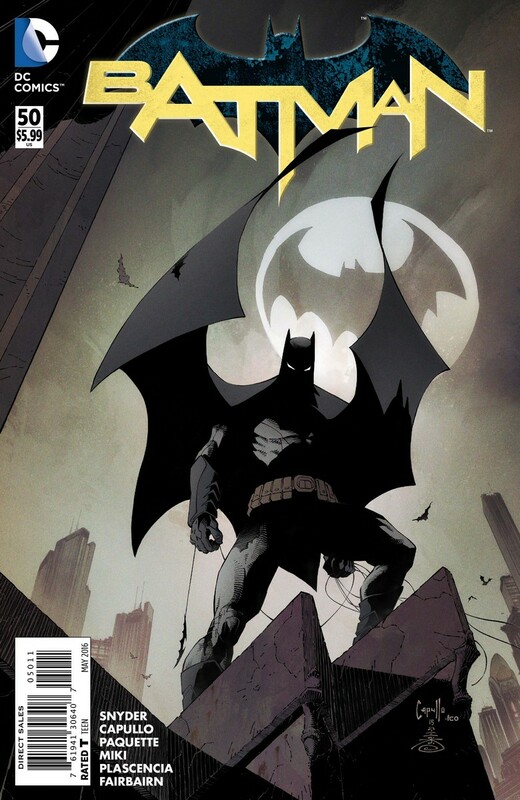 Snyder certainly puts Gordon though his paces in Batman #47, there’s a sense of poignancy and urgency in Gordon’s fight against his robotic partner, and the way he outwits his own suit whilst still managing to stay one step ahead of the super-powered attack of Mr Bloom shows just how far Jim has come since he stepped up to become Gotham’s new Batman. The scenes between Bruce and Duke in the subway station are another big highlight of this issue, and it’s a defining moment for these characters as Bruce’s past converges with the present as it screeches down the shadowy tracks of fate towards him. Greg Capullo’s art remains as spellbinding as ever. The dynamic panel layout places us right at the heart of the action, especially during the fight between Gordon and his robo Bat-Suit. Gordon’s struggle reaches some death defying heights, and there is a distinct claustrophobic feel to Batman’s face-off with Mr Bloom as well that feels extremely disquieting. But it’s that aforementioned scene between Bruce and Duke in the subway station where Capullo really shines this issue, with a magnificent fusion of story and art – one that also packs an incredibly powerful emotional punch; and will no doubt probably become the most iconic moment of this arc. As ever, Danny Miki’s intricate line-work makes every aspect of Capullo’s art leap from the page, and FCO Plascencia’s glorious use of color and tone makes this issue of Batman a veritable feast for the senses. This issue rounds off with Gordon and his team returning with a prisoner, but their victory is short lived, and its not long before Mr Bloom is able to strike back. Well, as another Bat-Truck bites the dust, it’s almost impossible to talk about this issue of Batman without totally spoiling the killer twist that awaits us in the closing pages. 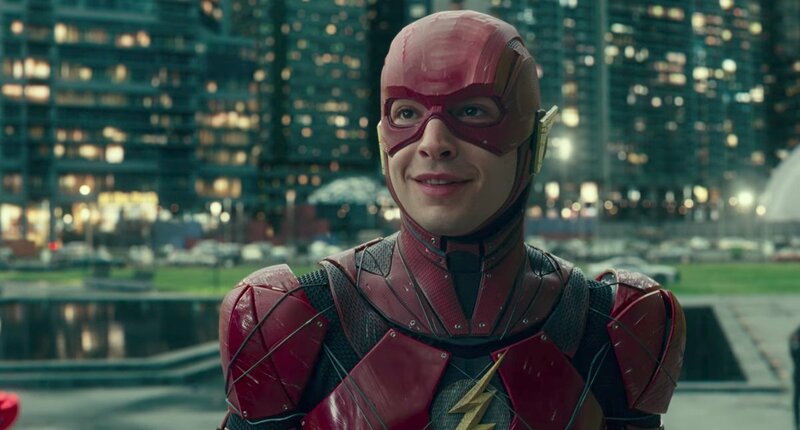 So, even though this review will be going out a bit late, let’s just say that a certain someone is back, and while this characters return might not have been wholly unexpected – especially considering Bruce’s surprise return at the start of this arc – it’s certainly a lot quicker than any of us could have expected! 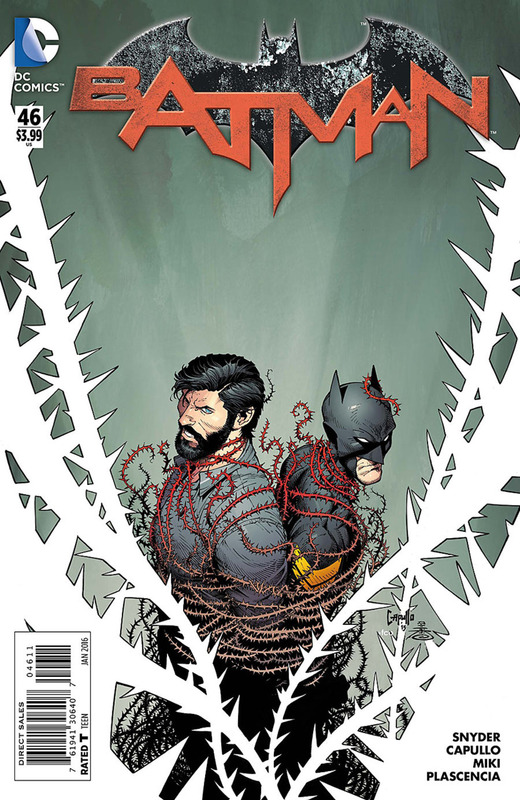 Batman #46 sees the fate of the new Batman hanging in the balance. However, it wont be the corporate big-wigs that will decide Jim Gordon‘s future, but instead the outcome of Batman’s battle with Mr Bloom – who has just spectacularly gate crashed the press conference at the Powers Building! Scott Snyder’s and Greg Capullo’s new Superheavy story-arc kicks into high gear in Batman #46 as Batman finally gets to square off against Mr Bloom! The fight between Batman and Mr Bloom in this issue has been a long time coming, but it certainly proves to be worth the wait! Mr Bloom seems to relish using his extraordinary powers, the meticulous precision of his attacks is shockingly graphic, cultivating a swath of terror across the rich lawn of Gotham’s high society, and his contribution to the fundraiser ensures that even Geri Powers gets to look evil right in the eye. Fortunately for the Powers CEO, Gordon, in his black-yellow EVA Bat-Suit, still has “rookie” mode and Julia to watch his back at a crucial moment, but the outcome of this tense encounter proves as insightful as it does unexpected. Scott Snyder orchestrates the slick action and character moments in this issue to perfection, making this easily one of the most impressively structured issues in the Superheavy arc so far. Having survived Endgame, Bruce Wayne’s life is no longer overshadowed by the legacy of the Bat. Bruce is deeply committed to his new role at the Lucius Fox Center for Gotham Youth, where he is working tirelessly to help the deprived areas of Gotham after the horror and destruction caused by the Joker virus, and he’s also in a relationship now with his former sweetheart Julie Madison. 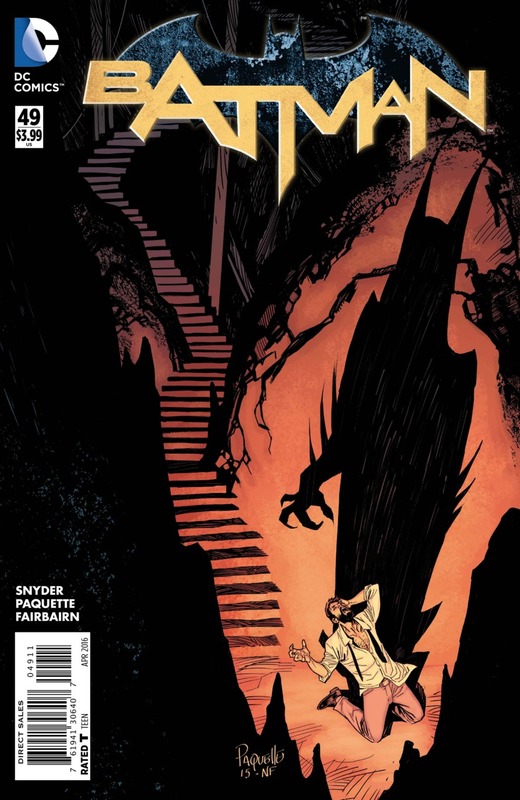 Scott Snyder continues to explore this brand new era for Bruce’s character in Batman #46 with an especially moving scene between Bruce and Julie, where we learn more about the uncanny connection from the past that has subsequently entwined their fates to bring them together in the present, which culminates in a beautifully romantic moment between them. Greg Capullo’s artwork for this issue is as exceptional as ever, his work on this series never ceases to amaze me, and there are some spectacular pages and layouts in Batman #46 that will simply leave you in awe of Capullo’s artistic talents. From the unflinching violence of the opening moments as Mr Bloom and Batman slug it out, though to the steamy interlude between Bruce and Julie, there’s also the imaginative birds eye view which oversees Duke’s mission at the new Iceberg Lounge where ice breaks the ice in the most poignant way imaginable, and the “prototypes” of the Batman Programme whose names alone will send your imagination stomping all over Gotham City are just a few of the many highlights in this issue of Batman. Danny Miki’s inks hone the fine details and nuances of Greg Capullo’s work to perfection, while FCO Plascencia’s exquisite color palette matches the tone, emotion, and atmosphere of ever scene magnificently. Batman #46 is another superb issue from Scott Snyder, together with outstanding artwork by Greg Capullo; it takes the Superheavy arc to a whole new level. There’s a few surprise plot twists thrown into the mix to keep us on our toes, and the gripping conclusion is sure to keep us all hanging in suspense until the next issue! 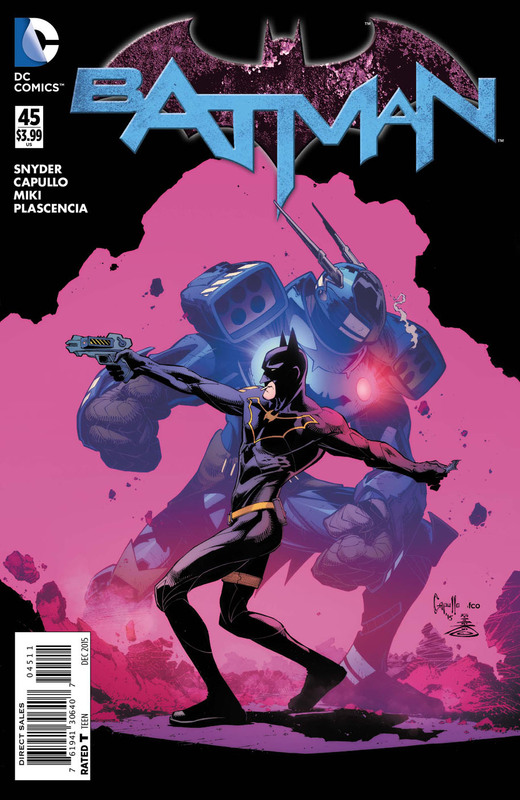 Batman #45 finds the former marine and Police Commissioner Jim Gordon facing his greatest challenge so far as Gotham’s corporate funded Robo-Batman. Trapped in a furnace, seemingly with no way out, this latest instalment of Scott Snyder’s and Greg Capullo’s new Superheavy story-arc places Gordon in mortal danger and confronts him with a situation that makes him question if he really has what it takes to wear the cowl. A number of plot threads entwine during this issue. Bruce and Julie Madison are busily helping the kids at the Lucius Fox Center for Gotham Youth, the area is still littered with the wreckage of the trophies from the Bat-Cave the Joker used for his parade during Endgame, and the horror and devastation caused by the Joker virus is still clearly evident. The relationship developing between Bruce and Julie is really moving, we get to learn more about Julie’s past, and the bond they share is inexorably linked with paths their lives have taken. Batman #45 is one hell of an action packed issue, Greg Capullo’s art captures the essence of every scene perfectly, and the way Capullo has Gordon evaluate the situation and escape from the furnace is brilliant. The Bat-Bot goes into full “partner mode” this issue, it’s another action-packed moment, and it works so well seen the context of Jim’s predicament. Danny Miki’s inks accentuate the finer details and nuances of Capullo’s art, especially in the scenes between Bruce and Julie, there’s also an interlude featuring Duke and Daryl that nicely refers back to the events of Batman #44 & We Are Robin #1, and FCO’s sublime colors take us from the roaring orange-purples-and reds of the furnace to the icy blue depths of Gotham were the Collider that Jeri Powers company has built to make one giant leap for man – and the periodic table – to the “island of stability” bring all the elements of story and art together in a way that is quite simply astounding. As for Mr Bloom, well, suffice to say we finally see him in action, and its blooming incredible! Bruce’s solution for dealing with the trophies proves to be utterly inspired too, and completely indicative of everything Snyder and Capullo have set out to accomplish with this arc. Batman #45 builds towards an exciting climax, with the powers-that-be poised to decide the new Batman’s fate, Jim must step up and show who’s the boss – just as terrible danger prepares to strike during a key moment of “censored” dialogue! Batman #45 is another excellent issue in the Superheavy arc from Scott Snyder, with terrific artwork by Greg Capullo, this storyline continues to throw new and unexpected curve balls our way with every new issue. The various plot strands seem to be coming together now, all of the characters get a good share of the limelight as well, and the stage is now set for one hell of a face-off between the new Batman and Mr Bloom!